Home Brands and Products Colourpop Flutes and Between the Sheets. Colourpop Flutes and Between the Sheets review. As many of you may know, Colourpop makes my favorite lipliners. The price, creamy application and pigment are outstanding. 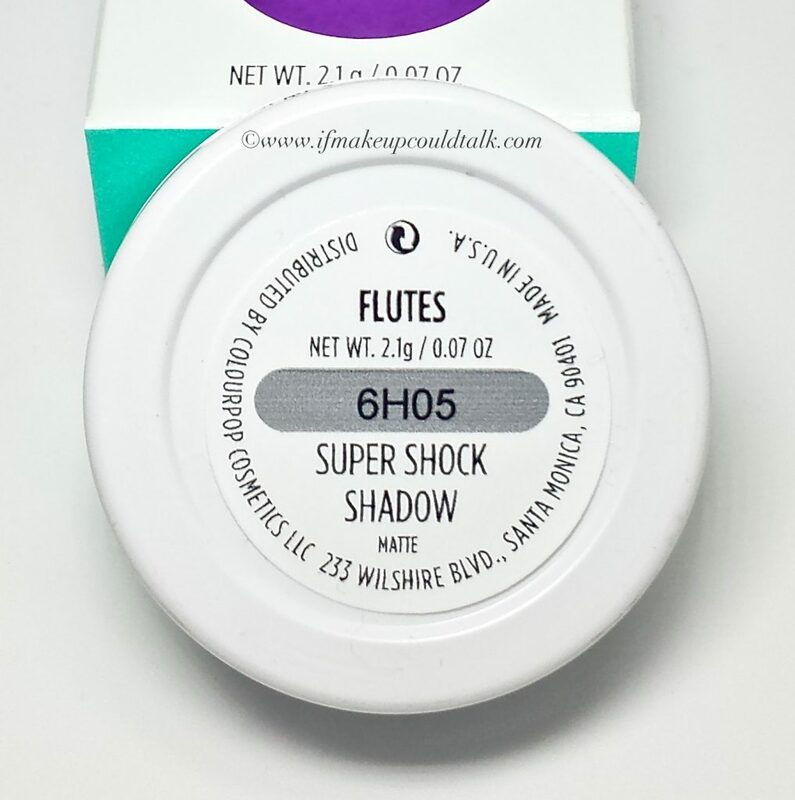 So while placing an order to replenish my beloved BFF2 liner (reviewed here), I decided to pick up Colourpop Flutes Super Shock Shadow ($5 USD/ 2.1g) and Between the Sheets blush ($8 USD/ 4.2g). The smooth consistency, concentrated pigment and lasting power are nothing short of amazing. Let’s not forget, the affordable price makes these purchases even sweeter. 🙂 I hope you enjoy. 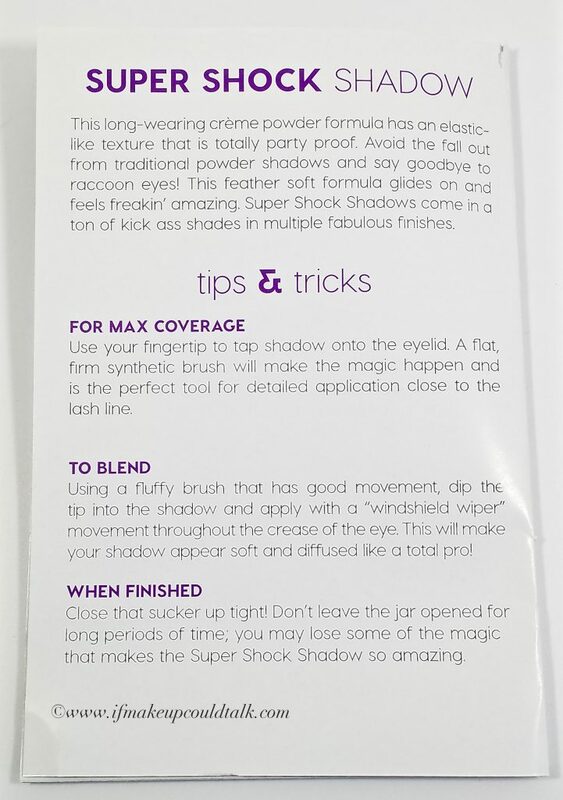 Colourpop Super Shock Eyeshadow application directions. Colourpop Flutes is appropriately described as a matte “mid-tone yellow-brown.” This color was selected specifically as a replacement for my precious MAC Uninterrupted. The unique cream to power consistency is inherently more concentrated than a straight up powder shadow. Base on the company’s suggestion, a synthetic brush works best to pick up and apply the pigment to the skin. However, since my synthetic brush selection is somewhat underwhelming, I turned to my natural Eve Pearl 105 brush for favorable results. The short, dense, slightly firm hair bundling is able to capture the pigment within the fibers and deposit a saturated amount to the crease. 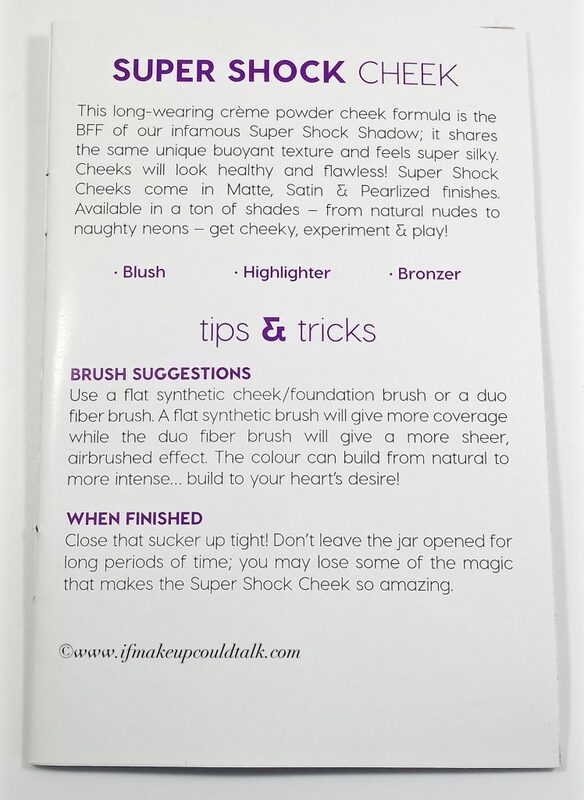 The creamy formula is then easily manipulated across the skin with the same brush, fingers or a fluffier brush. Another impressive feature is the lasting power of the matte formula. Flutes truly lasts from morning to evening without fading or creasing. This point is driven home by my comparison swatches below. 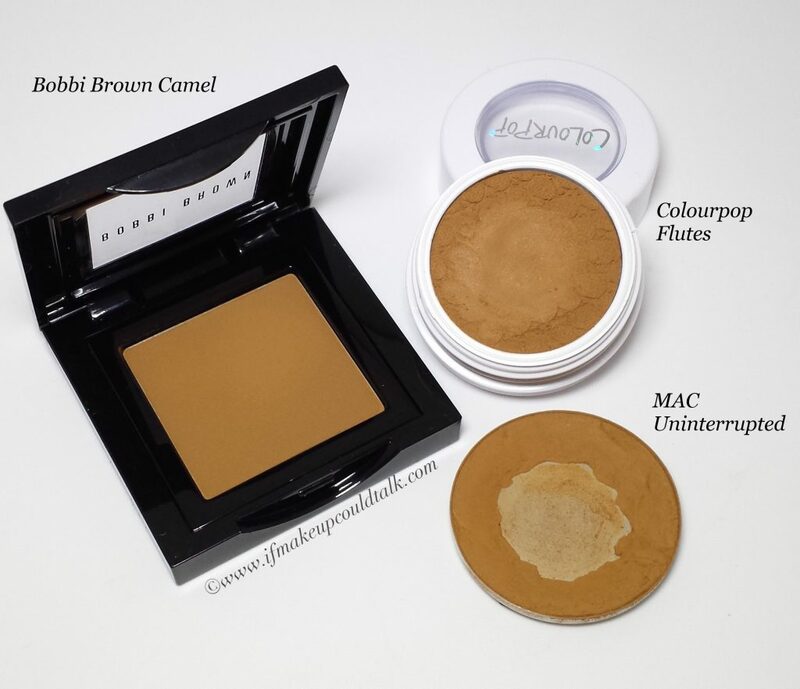 The directions above describe the formula as a “cream powder,” but in my experience, the matte colors act very much like a long wearing cream eyeshadow; once Flutes sets it does not budge. As stated in my previous review (here), Colourpop’s colors cannot be depotted. As a makeup artist, this can become quite bothersome when doing multiple clients. Opening and closing pots during a makeup season can be incredibly time-consuming. Forgetting to cap these eyeshadows is not an option. Colourpop containers must be closed tightly immediately after use or the product’s malleability becomes compromised. Bobbi Brown Camel, Colourpop Flutes, and MAC Uninterrupted. 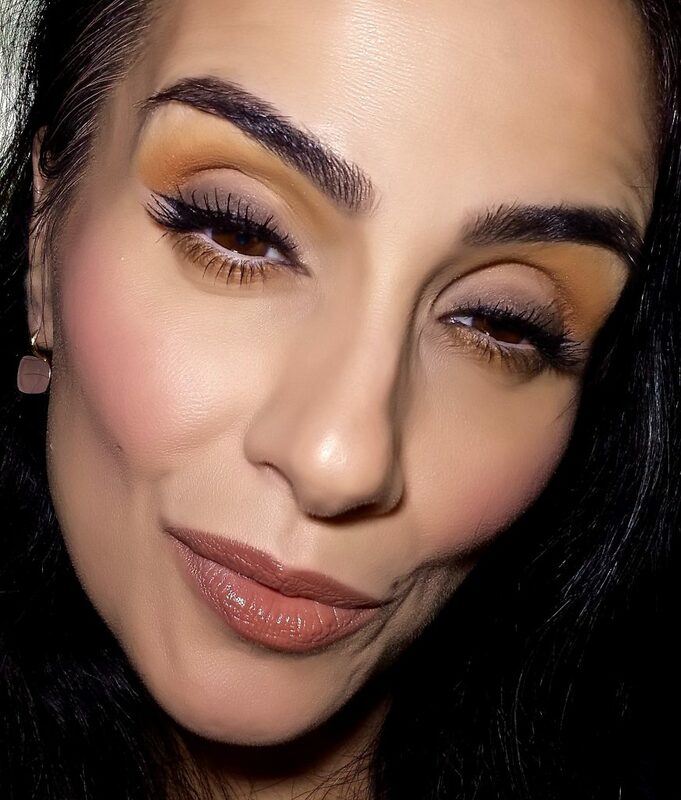 Bobbi Brown Camel, Colourpop Flutes, and MAC Uninterrupted wiped five times with a dry towel. 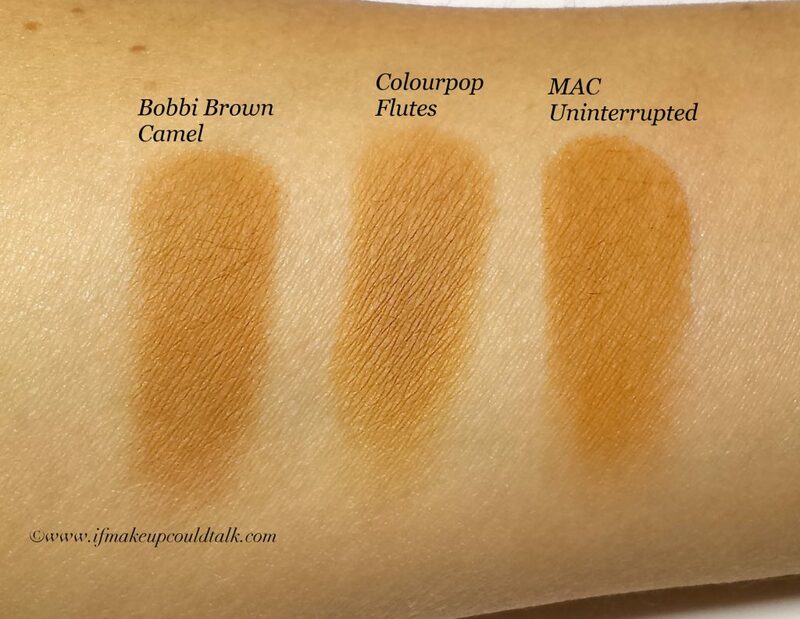 Bobbi Brown Camel ($25 USD/ 2.5g) is a 95% dupe for Uninterrupted and contains slightly more brown than Flutes or Uninterrupted. This color was purchased for professional use. The powder composition can easily be stored in any palette and is not hindered by air exposure. As you can tell, all three colors are painfully similar and gorgeous. 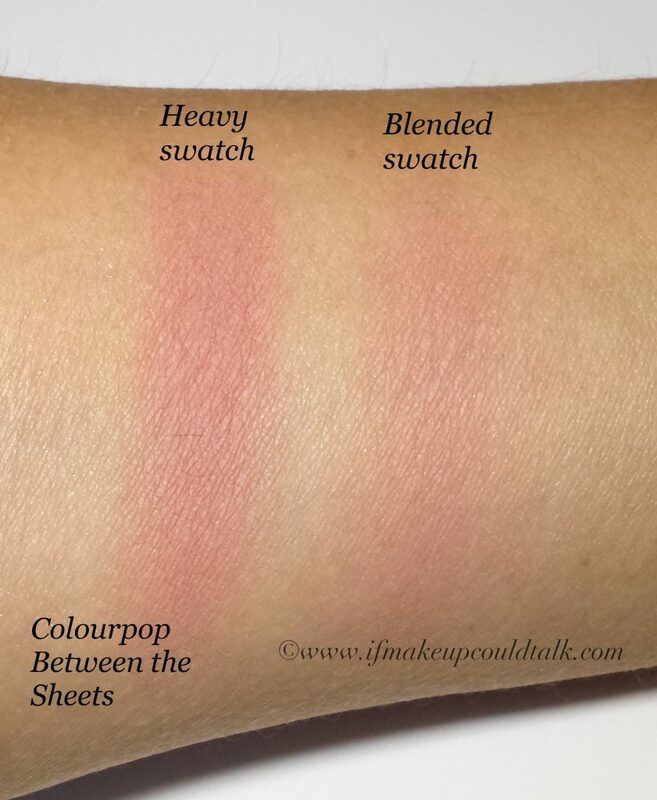 The intensity on an arm swatch may vary, but once on the lids the difference in make is barely noticeable. Colourpop Flutes ($5 USD/ 2.1g) is the closest affordable dupe for Uninterrupted. Although Flutes swatches deeper than Camel or Uninterrupted, I find it applies more vibrantly on the lids. In addition, the longevity of this color/formula is superb. The third photo above shows what color remains after the swatches were wiped several times with a dry towel. Clearly, all three brands held up well under these circumstances, but Flutes is the clear victor, refusing to depart from my arm. A dual action makeup remover seems to be its only adversary. 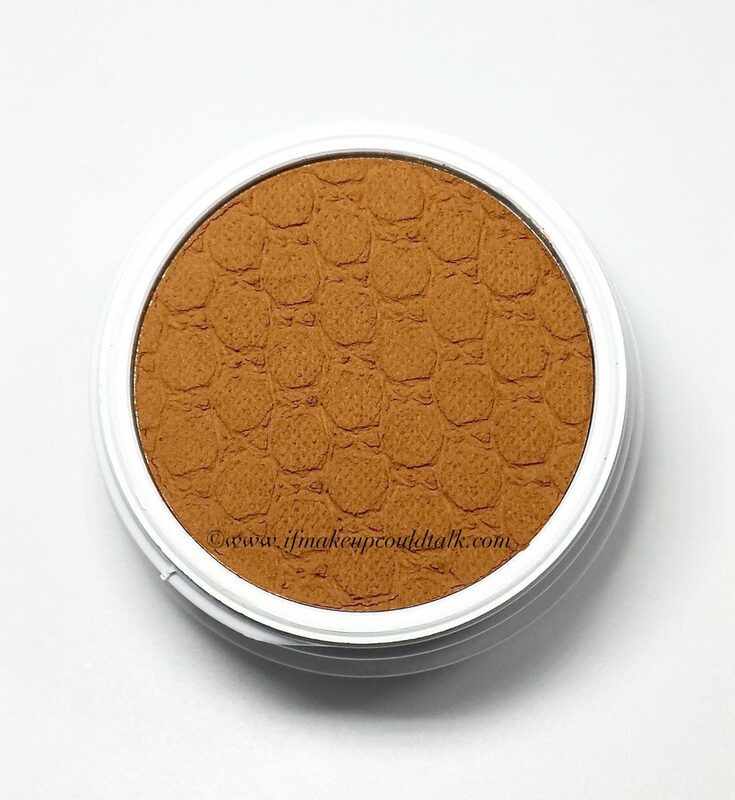 MAC Uninterrupted (discontinued) was the original sepia color that captured my attention on its initial release. I have loved and utilized this shade in my makeup routine for the past four years. However, as of late, my pan is literally falling apart. I find small chunks of color scattered throughout my palette every morning. 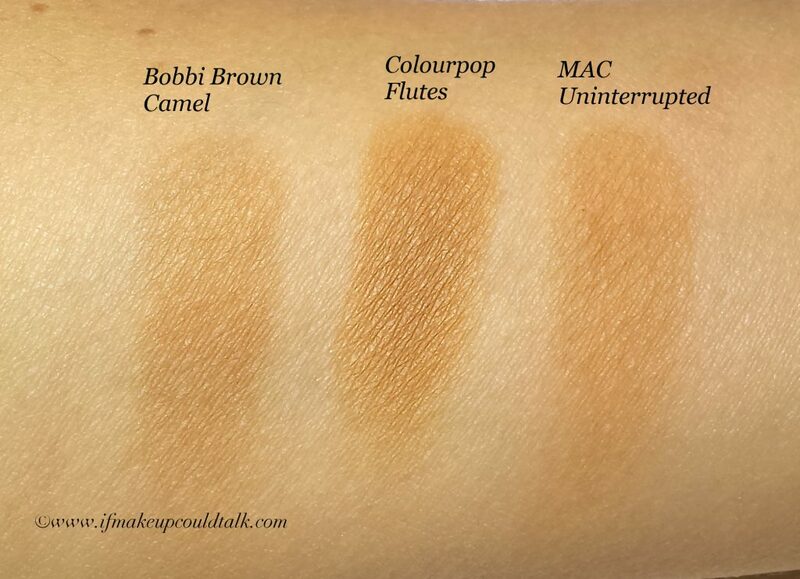 Uninterrupted has slightly more yellow in the formula when compared to Camel or Flutes. Colourpop Between the Sheets blush is described as a “mid-tone beige pink.” On my olive skin, I had a hard time deciphering the beige in the description. Between the Sheets is distinctly a cooler based pink against my complexion. 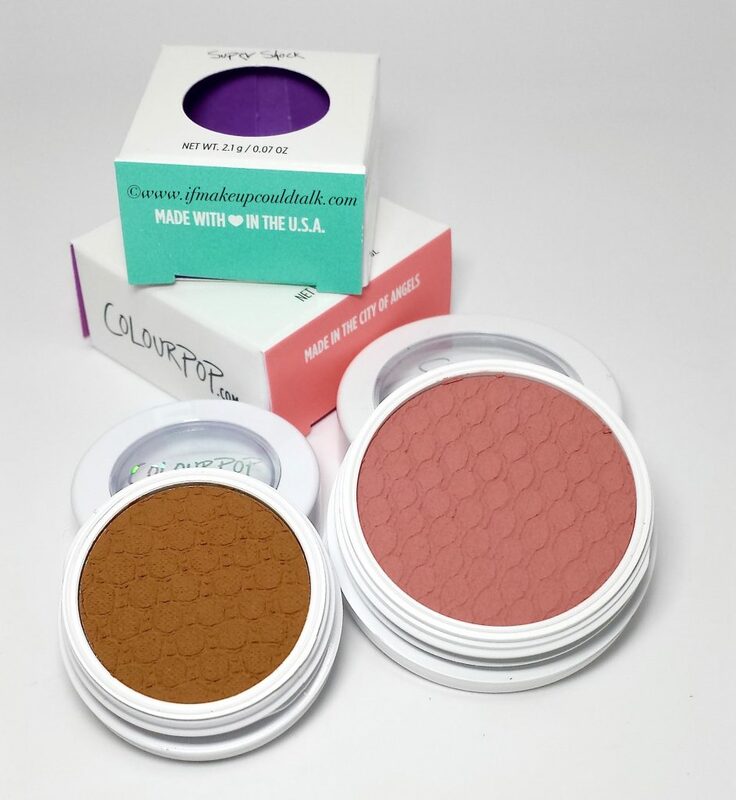 The Colourpop blushes are manufactured with the same formula as their eyeshadows, containing exactly twice the amount. They also apply in the same manner as the Super Shock Shadows. However, despite the synthetic brush suggestion, I discovered Sonia Kashuk #17 brush (discussed here) works so well with this texture. The dense, natural hairs pick up and deposit the perfect amount of pigment on the skin. Utilizing bouncing motions seems to yield optimal results. I simply bounce the brush head directly in the blush and apply the color to the cheeks in the same manner. Personally, fingers did not give me the same intensity or blendability I was able to achieve with this brush. 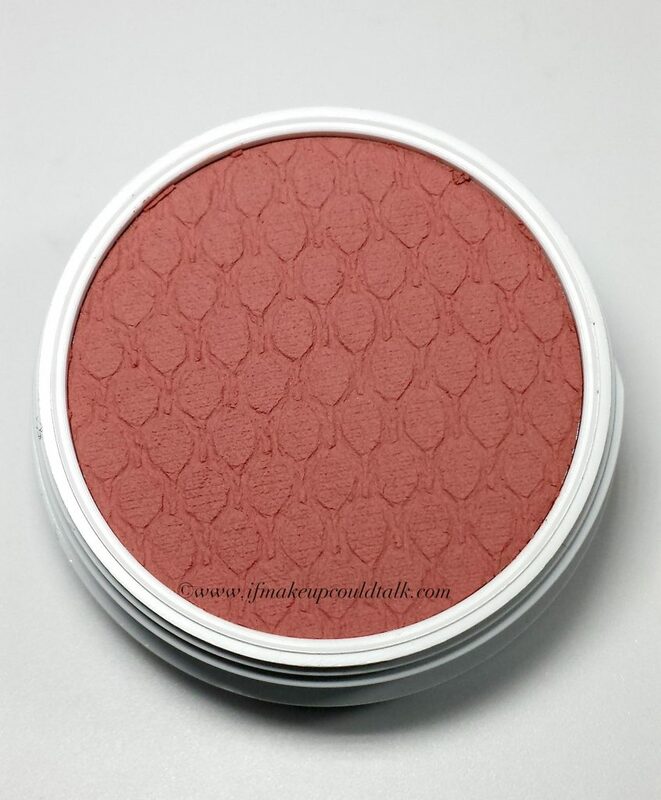 Admittedly, this is not my preferred blush color, but just like Flutes, the formula has outstanding longevity. In the photo below, BTS and Flutes lasted a full 12 hours without fading. On this day, I was confined to a humid pool environment for three hours running around photographing a swim meet. Granted, on my dry skin these results are not out of the ordinary, but based on these irregular environmental conditions, I can totally see this formulation working quite well for oiler skins. Makeup would tell you Colourpop Flutes is a definite favorite. This color has rid me of unfounded anxiety over finding a suitable replacement for my beloved MAC Uninterrupted. As for Between the Sheets, the longevity is noteworthy and a great option for paler/cooler complexions. With that being said, the formula has impressed me enough to invest in Colourpop Aphrodisiac–a soft brown color with a hint of rosy warmth. Bottom line, once you find the right way/tool to apply this special formula, the results will have you asking, “Why did I wait so long to try Colourpop?” 🙂 Until next time, be well, stay safe and be happy.